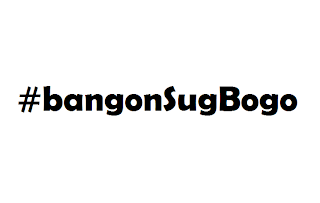 After staging three successful concerts to raise funds for the victims of the recent calamities in Central and Eastern Visayas, the fourth edition is set on Saturday, this time for the typhoon-stricken city of Bogo in northern Cebu by a group that now calls itself Bangon SugBogo. It is actually the same group that launched the #BangonSugBohol benefit shows to raise funds for relief and rehabilitation of communities devastated by the 7.2-magnitude earthquake in Cebu and Bohol last Oct. 15. Organizers said the objective of the concert is not just raise funds but also to "uplift the spirits of residents in north Cebu who were ravaged by Yolanda." "They don't have a roof, they don't have food and they don't have entertainment so we saw the opportunity to go there and stage the concert. Everyone is free to attend," said Wilson Ng, one of the event organizers. "We expect more than 5,000 people to come so we urge everyone to invite their friends. Even people from Cebu City. Let's go there and join everyone to support," he added. The concert which coincides with Andres Bonifacio Day on Nov. 30 is dubbed "Everyone is a Hero" to honor everyone who volunteered in the relief operations. 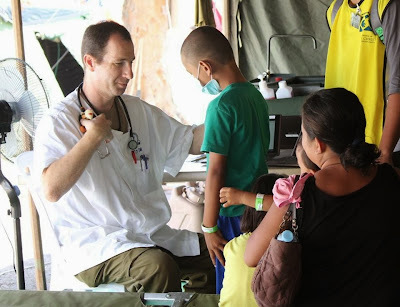 After two weeks of extending medical relief to about two thousand residents in the City of Bogo and its neighboring municipalities, the Israeli Defense Forces (IDF) and the Israeli Ministry of Foreign Affairs yesterday turned over its field hospital (mobile hospital) to two foreign non-government organizations - LandsAid, a German NGO and Workers' Samaritan Federation Austria (ASBÖ), an Austrian NGO. 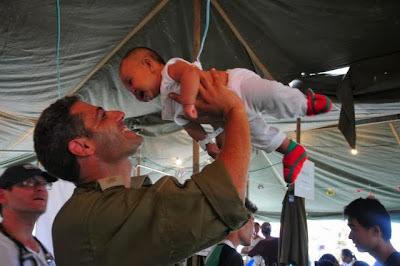 The two NGO's will assume and take over the medical assistance that was extended by the Israeli medical crew. 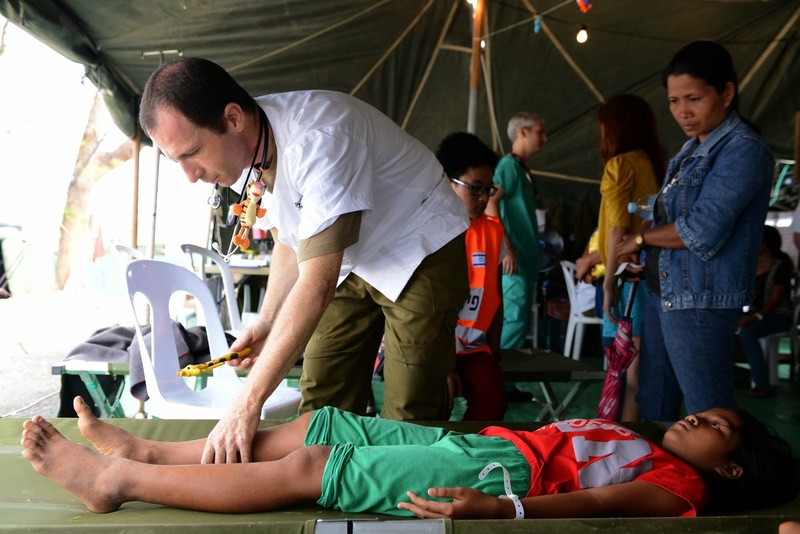 The turnover of the mobile hospital was witnessed by Ambassador of Israel to the Philippines Menashe Bar On, Bogo City Mayor Celestino Martinez Jr., and IDF Col. Yoram Laredo. According to the IDF blog, in over a time span of nearly two weeks, 2686 patients (848 were children) have been treated in the field hospital in Bogo City by IDF doctors. 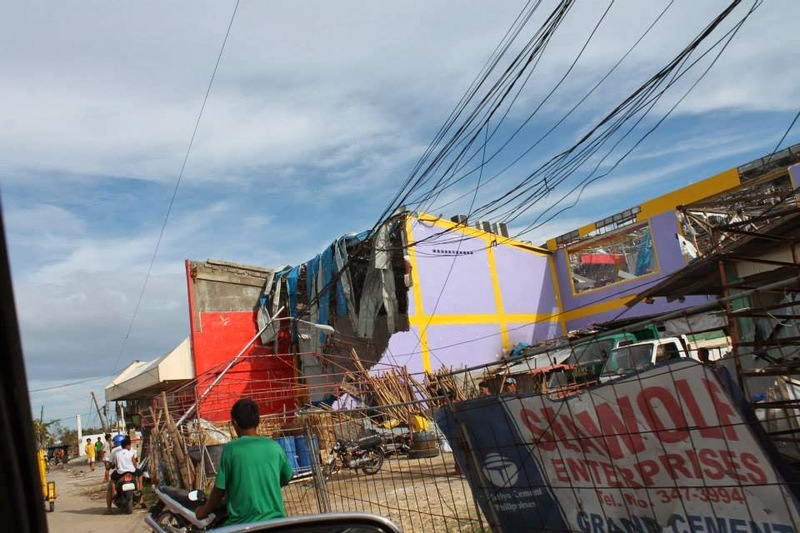 Major power lines have now been restored two weeks after super typhoon Yolanda (International name: Haiyan) ravaged the northern part of Cebu. The Freeman reported that all municipalities in northern Cebu including the cities of Bogo and Danao have been energized except for some mountain barangays and places where restoration of the lateral lines are still ongoing. 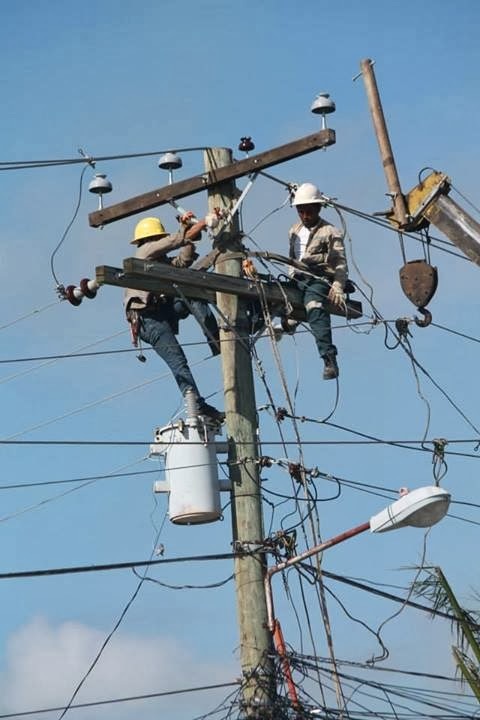 The backbone lines of Cebu Electric Cooperative II (CEBECO II) serving Compostela, Borbon, Tabogon, Tabuelan, Tuburan, Carmen, City of Danao and City of Bogo were already restored. The backbone lines are also partially serving Catmon, Sogod and San Remigio. 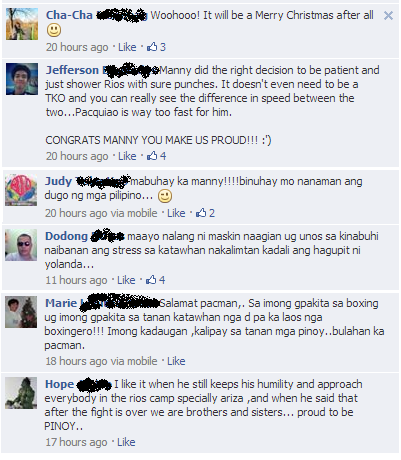 Bogohanons rejoiced after boxing hero Manny Pacquiao thrashed Brandon Rios to clinch the WBO international welterweight title in Macau yesterday. Bogohanons flocked to the Don Celestino Matinez Sr. Sports Complex yesterday to watch the Pacquiao - Rios fight. The Pinoy boxing hero dedicated the fight to the victims of super typhoon Yolanda. For the first time in almost a year, Pacquiao returned to the ring and wore Rios down with his blinding handspeed and won 120-108, 119-109 and 118-110 on the scorecards at The Venetian casino in Macau. Per CompuBox, Pacquiao landed 281 of 790 punches(36%) while Rios only landed 138 of 502 punches(27%). After the fight, Pacquiao said he is willing to fight anybody including Floyd Mayweather Jr. Boxing promoter Bob Arum said Pacquiao's next fight is on April 12 next year. Pacquiao vs. Rios: Does Manny Matter Again After Dominant Win? 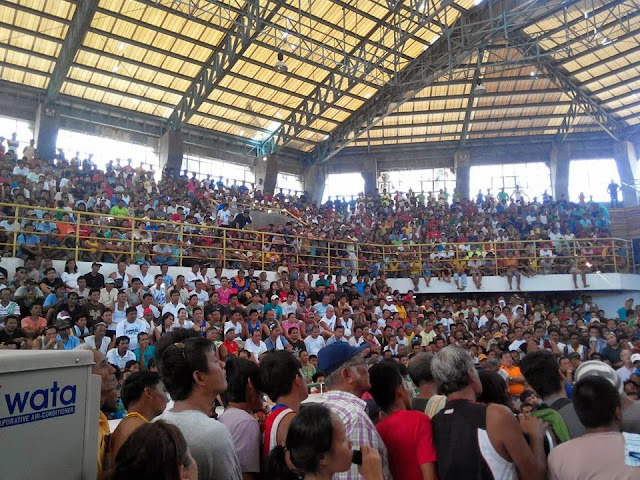 With this marching order, Bogo City Mayor Celestino “Junie” Martinez Jr dismissed his meeting with barangay (village) captains at a sports complex, the base for relief operations in this northern Cebu city reeling from Super Typhoon Yolanda (Haiyan). Named after the mayor’s father, the Don Celestino Martinez Coliseum is not just the drop-off point for aid. It is where officials now work after Haiyan brought down the newly built city hall’s ceiling, roof and windows. Known as the center for trade and commerce in northern Cebu, Bogo City is now grappling with the lack of electricity, damaged schools and hospitals, and homelessness for 90% of its people. The city is home to over 80,000 residents. Thirteen died in Bogo, among the over 4,000 fatalities in central Philippines. Yet city employees and authorities are making do and getting organized. On blackboards, they keep track of the casualties, damages, and aid trickling in to the 29 barangays. They are determined not to make their community helpless. An Israeli doctor performs a physical check up to his patient at the Israel Mobile Hospital in Bogo City. “We are relying on donations but it’s not a total doleout. Starting Monday, the city government is employing 100 people per barangay. We call it cash for work. 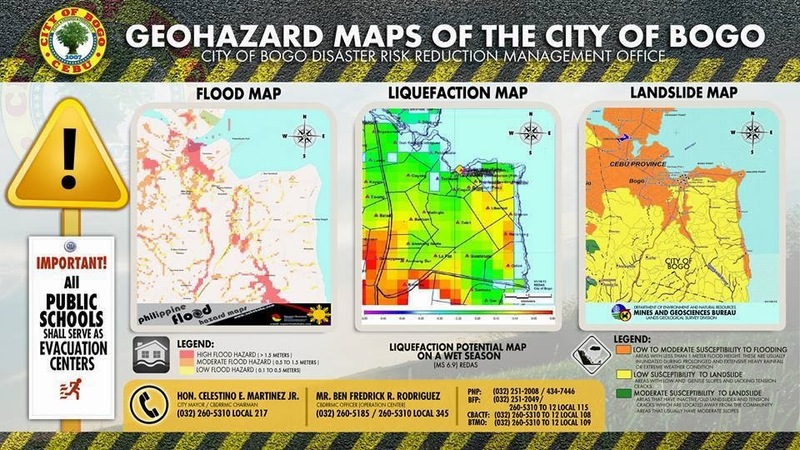 We pay them and then they have to clean up the city,” Martinez told Rappler on Monday, November 18. Bogo City Mayor Celestino Martinez, Jr. has launched a program intended to speed up rehabilitation work that will hasten the recovery of the city. Dubbed “Cash for Work, Food for Work”, the program consists of two phases. 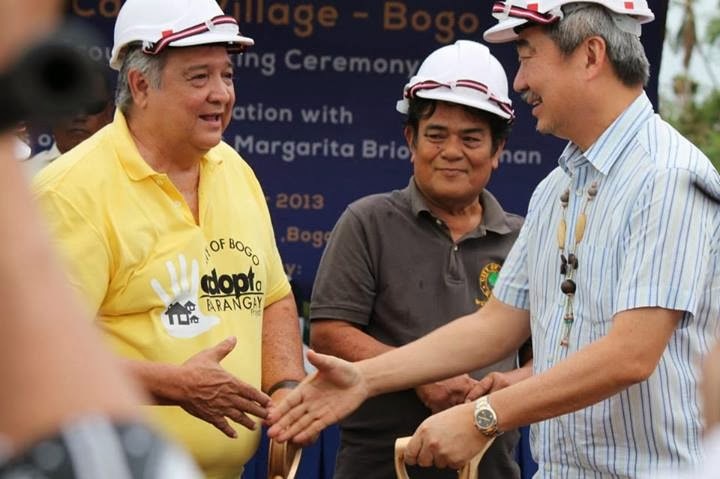 The first phase involves giving work to 100 residents in each of Bogo’s 29 barangays for a week, employing them to clean up their respective villages and communities. They will be paid with cash so they can have a starter fund to help them start a new chapter in their lives. The second phase is to let them do repair work on their own houses for a week, and even if it is their own houses they will be working on they will still be paid with food. The beneficiary residents will be chosen by the barangay officials based on the gravity of the damage to their houses. The program will show the people that the city government is committed to help them get back on their feet. This time, however, it shall not be the “dole-out” way. Mayor Martinez explains that through the “Cash for Work, Cash for Food” his constituents will receive government assistance through a program that discourages mendicancy among his people. To him it is important that the people rebuild their lives with their dignity intact, through a work ethic and a renewed attitude that will make them stronger and more self-reliant in the face of adversities. Next in line is the city government’s shelter program that will allow the homeless to avail of a P35,000 loan to build their own homes, payable for 20 years, with a 2-year grace period, at an amortization that will range from P150.00 to P170.00 per month. Barely a month after the destructive earthquake, another threat from mother nature looms to hit Cebu and other parts of Central Visayas. Government agencies go on full alert as a possible super typhoon, Yolanda (international name: Haiyan) is expected to make landfall by Friday, with possible heavy rains on Thursday. The weather was fair throughout yesterday (Wednesday), but LGU's have already held numerous meetings to prepare for Yolanda. 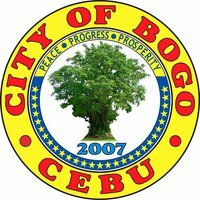 Solar News reported that authorities have their eye on northern Cebu, specifically the City of Bogo as it could be the hardest hit when Yolanda ploughs through the province according to its plotted course. Governor Hilario P. Davide III declared suspension of classes in all levels in the entire province of Cebu beginning Thursday until Friday (November 7-8). by Mayor Celestino E. Martinez Jr.
George Hoffman used to say that no one person can change the world but that you can change the world for one person. I remember this saying well each time I assess the progress of the many big projects I have long dreamed for our beloved city. Together with Vice-Mayor Santiago Sevilla and the other officials I dream of the New Business District as the epicenter of progress and development in northern Cebu; the Special Economic Zone as another major hub of light to medium industries in the province; the expanded Polambato Port as major gateway to the country’s nautical highway and Bogo’s main portal as logistics distribution center of the Visayas region; the proposed Banakod Eco-Park as the new centerpiece in our quest to make Bogo a major player in the tourism industry;and the construction of agribusiness infrastructures to make our city an important contributor to the country’s effort at food sufficiency. It might be added that the end goal of all these is actually to improve the quality of life of everybody in the city in a grand way. Sad to say, the mere shaping of these dreams alone into workable concepts and blueprints already takes so much time and money. Anyway, Rome was not built in a day, thus, we can be forgiven if many of our dreams have not yet turned into full reality. We can honestly say, though, that all of the above dreams are works in progress. But while waiting for the ultimate development dream pie to be baked, government must continue with its humdrum tasks that enable the constituents to live better lives each day. Collecting taxes, sweeping the streets, taking the sludge out of canals, keeping the traffic flowing and safe, keeping the local library newsstand updated, stacking the clinic with much needed gauze or medicines, turning on the faucets or the lights; in other words, keeping the hum of ordinary government machinery alive is also what local governance is all about. Yet, these are tasks that by their very ordinariness too often escape the eye. We may never know how much they are earning today compared to those times when they were still pushing carts but we can be sure their income now are much better. The government has been making sure of that by keeping the barbecue garden clean and beautiful and by supporting the vendors with regular activities that would tend to attract more people to the place. And as final note I would like to thank former San Vicente barangay captain Virginia Rodrigo for having the courage and determination to push through with a difficult project and later allowing its use for the city government so that more people may benefit from it. It is a story of cooperation that hopefully will turn into a tradition. For in our beloved city we have inherited a lot of prideful traditions, and it is never a bad thing to add more good ones to those we already have. Who knows the next one might just help turn one of our big dreams into reality one fine day. Nahimo si Nyor Indong nga Presidente-Munisipal sa Bogo sa panahon ni Hen. 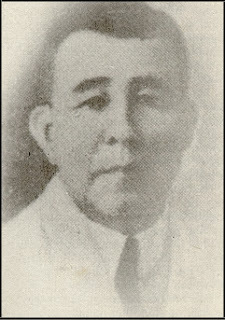 Emilio Aguinaldo sulod sa mga tuig 1898 hangtud sa 1903. 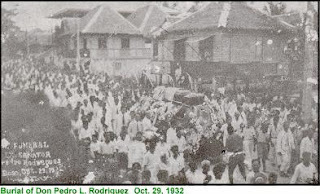 Ug sa 1905 miadto sa Espanya ug sa ubang dapit sa Uropa ug paghibalik, ginominahna siya isip usa ka delegado alang sa unga Asembliya sa Pilipinas. Unya sa 1907 mirepresentar kumo senador samtang ang iyang igsoon, Celestino Rodriguez - deputado sa unag distrito. "....Dinhi sa ibabaw sa kalibotan, duruha da ka bukid ang labing bantugan, ang bukid sa senai ug ang bukid as sudlong. Apan alang sa mga Pilipino ang bukid sa sudlon maoy labing mahal ug halandumon, kay sa tumoy-tumoy sa iyang sima...diha mahitarok ang unang bandilang Pilipinhon nga gipakayab sa panganod Sugboanon...nga gipaagasan ug daghang dugo sa atong mga kaliwat aron paglaban sa inahan tang yuta...."
Mapuslanon kaayo an giyang pag-alagad sa unang hugna sa Sendaorya, nga maoy nakapaaghat kaniya pag-usab pag-apil sa kombensyon sa pagka Senador batok kang Don Filemon Sotto sa partido Nasyonalista. Kadaghan sa mga delegado habig kang Don Sotto ug gihukman nga modaug sa kombensyon. "...Minahal kong mga delegado sa kombensyon: kon tinuod man ugaling nga ang kalibotan tang gipuy-an matapus unya manudya? Sa panahon nga ang tawo mabanhaw... akoy unang mobangon gikan sa akong lubanganan dinala sa akong mga bukton ug ipakayab ko sa kahanginang Pilipinhon ang bandila sa partido Nasyonalista...ug kon walay suwerte ning kombensyona, ako moyukbo og motabang sa maong partido nga minugna...tinukod ug gipangulohan ni Don Sergion Osmeña..."
Makabungog ang gahub nga mibukot sulod sa Sine Ideal diin himoa ang tigom sa kombensiyon. Kadtong mga pulonga nga nanuhotsuhot sa kinailadman sa katawhan maoy nakapadaug kaniya niadtong higayona. Gisublian si Nyor Indong sa 10th Senatorial District diin mimayoriyag daku labaw kang deputado Vicente Sotto sa partido Demokrata. Sa Senado usa siya sa manggimbuhaton, bantugang mamumulong, nagsilbe sa katarung ug kaligdong. Ug supak sa katungod kun ugaling dili mahiangay sa mga lungsoranon. Si Don Pedro Rodriguez mao ang "Pahid" sa luha sa mga kabus, kay lagi mahigugmaon man sa mga timawa. Ang magkinahanglan ug yta, gibaligyaan sa kubos nga bili ug pinaagi pa sa data-data. Nagpahulam ug salapi nga walay tanto. Gihalad ang iyang kinabuhi pagtukaw pagtabang niadtong nanagkamang sa kapit-os ug kakabus. Katoliko Romano si Nyor Indong sanglit gitugahan man ug lote alang sa Simbahan sa Bogo ug Medellin. An earthquake of magnitude 7.2 shook the island of Bohol and nearby provinces on October 15, 2013 at 8:12 AM. Inquirer reported that the damage caused by the destructive earthquake in Bohol has been estimated to reach P2.5 billion. The City of Bogo LGU initiated a relief assistance for Bohol to help get back on its feet. 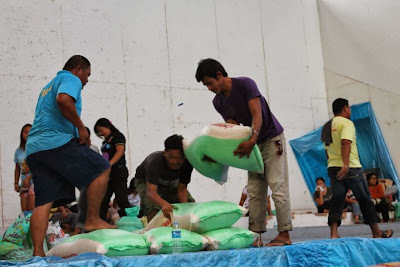 The relief operation is dubbed as "IGSOONG BOHOLANON MAHALON: HALAD TABANG ALANG SA BOHOL". 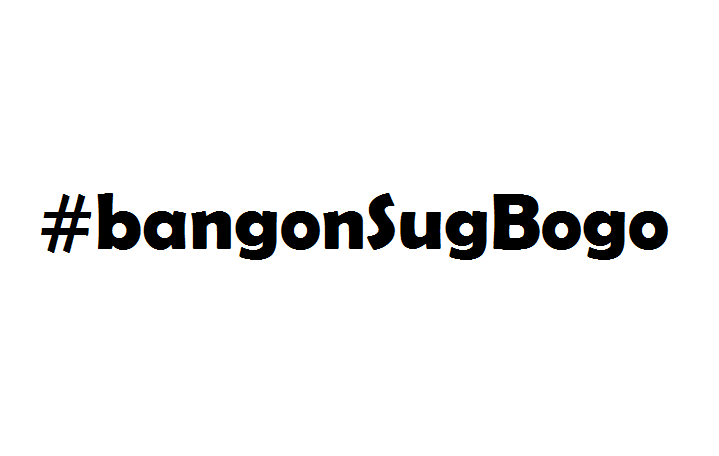 One of the Bogohanon groups on facebook, Taga Bogo Ka Kung (TBKK), also initiated the "10 Peso Ko Tulong Ko" donation drive. 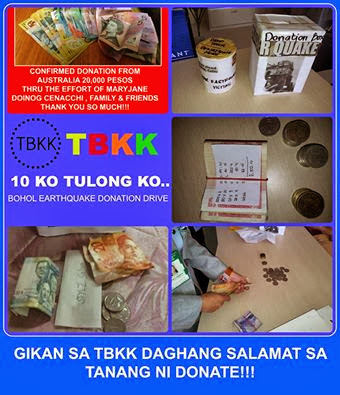 TBKK's donation drive has now gathered around eleven thousand pesos (P11,111) as of the last counting. The Bogo Times is encouraging all Bogohanons to support these relief operations and help our brothers in Bohol. Earthquake is one of the most difficult natural disasters to prepare for. The difficulty is in the fact that a tremor can happen anywhere and anytime. This infographic shows the safety measures which we need to take during earthquakes along with the controversial “Triangle of Life” theory. Victims of the earthquake may receive assistance from Pag-IBIG Fund which set aside P4.5 billion for calamity loans where members can avail of 80 percent of their total savings with only 5.95 percent interest. Pag-Ibig has installed mobile service desks located in front of the Mandaue City Hall, in Gaisano Capital Danao, at the Bogo Service Office on the second floor of J & N building in Bogo City, at the Gaisano Island Mall in Pusok, Lapu-Lapu City and at the Tagbilaran City Hall and at the Governor’s Mansion in Bohol. Resides in an area which is declared by the Office of the President or the Sanggunian concerned as under a state of calamity. If the member has an existing Housing Loan, Multi-Purpose Loan (MPL) and/or Calamity Loan, the account must not be in default as of the date of the loan application. How much can one loan? Up to 80% of the eligible member’s total accumulated value (TAV, equivalent to member’s contri. plus employer’s contri. plus earned dividends). The current interest rate is 5.95% per annum. The loan is amortized over a period of 24 months, with a grace period of 3 months, i.e., the eligible member has a 3-month reprieve and only starts paying on the 4th month. Can one still loan if he/she has an outstanding MPL/calamity loan? Yes, but the outstanding MPL balance shall be deducted from the 80% of TAV. For example, if a member has a TAV of P10,000, the maximum loanable amount is P8,000. If the member has an outstanding MPL of P5,000, the member can only avail of calamity loan worth P3,000. If, in addition to an outstanding MPL, the member also has an outstanding calamity loan in the amount of P2,000, in the example above, the member is still granted a new calamity loan of P3,000 but will only receive P1,000 because the P2,000 will pay off the existing calamity loan balance. This means that at any given time, a member can have both MPL and calamity loan, but only one calamity loan. Until when can an eligible member avail of the loan? Within a period of 90 days from the declaration of a state of calamity. What are the documentary requirements for the loan application? For further inquiries, call 5059759 or 5059761 or email at cebunorth@pagibigfund.gov.ph. President Benigno Aquino III has declared the 15th of October this year as a regular holiday throughout the Philippines in observance of Eid-ul Adha or the Feast of Sacrifice. NOW, THEREFORE, I, BENIGNO S. AQUINO III, President of the Philippines, by virtue of the powers vested in me by law, do hereby declare Tuesday, 15 October 2013, as a regular holiday throughout the country, in observance of Eidul Adha (Feast of Sacrifice). Done in the City of Manila, this 3rd day of October, in the year of Our Lord, Two Thousand and Thirteen. Eid-ul-Adha (Arabic: عيد الأضحى‎ ʻĪd al-’Aḍḥá, IPA: [ʕiːd al ʔadˁˈħaː]) or the Festival of Sacrifice also known as the Greater Eid, is the 2nd most important festival in the Muslim calendar. The festival remembers the prophet Ibrahim's (known as Abraham in the Bible's Old Testament) willingness to sacrifice his own son when God ordered him to. 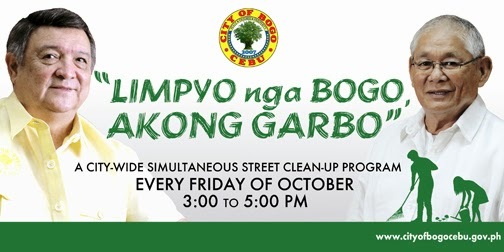 A city-wide simultaneous street cleaning program will be initiated to maintain the cleanliness of the city. The program is entitled "Limpyo nga Bogo, Akong Garbo" which will start this Friday, October 4, 2013. This will be participated by the Barangay Councils of the urban barangays, DepEd Bogo City Division, Private Schools, Bankers and NGO's every Friday of the month of October, 3:00 P.M - 5:00 P.M.. 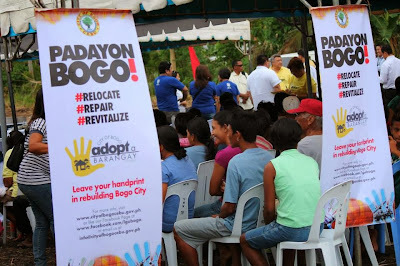 It was on the year 1999 when Bogo (then a Municipality) was hailed, for the fifth time, as Cleanest and Greenest Municipality in the Philippines and the first municipality to make it to the Hall of Fame. 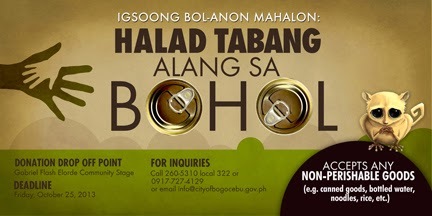 The Bogo Times encourages all Bogohanons to participate and help maintain the city's clean and green environment. The Cebu II Electric Cooperative, Inc. is looking for a Cadet Engineer to supervise and implement programs for operation and maintenance of distribution lines within the assigned area of responsibility. Male / Female - not more than 26 years old. Must be a registered Electrical Engineer. Knowledge / experience on AutoCAD (2D or 3D). Excellent in both written and oral communications, good interpersonal skills. Reliable and attentive to details and experience on handling people is desirable. Have the ability to multi-task and must be willing to work on a flexible schedule. Possess good personality traits and in good mental/physical health. Must possess a valide Professional Driver's License (Restriction 1 and 2). - CEBECO II became the first to be awarded as the "Most Outstanding Electric Cooperative in the Philippines" in 1985 by NEA. - CEBECO II has been categorized by the National Electrification Administration (NEA) as Categroy A+, Extra Large EC. 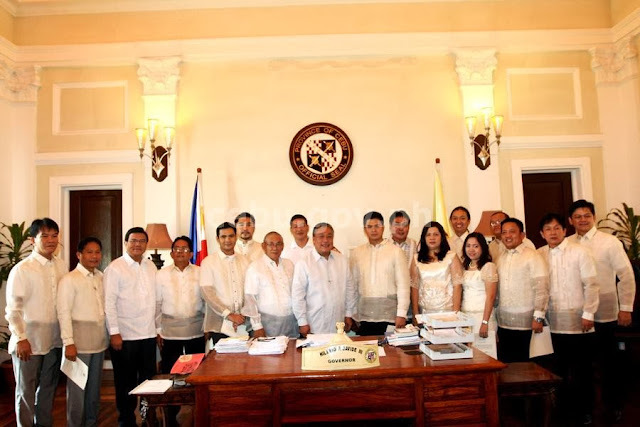 - CEBECO II covers eleven (11) municipalities and two (2) cities including: Daanbantayan, Medellin, San Remigio, Bogo City, Tabogon, Tabuelan, Borbon, Sogod, Tuburan, Catmon, Carmen, Compostela and Danao City. 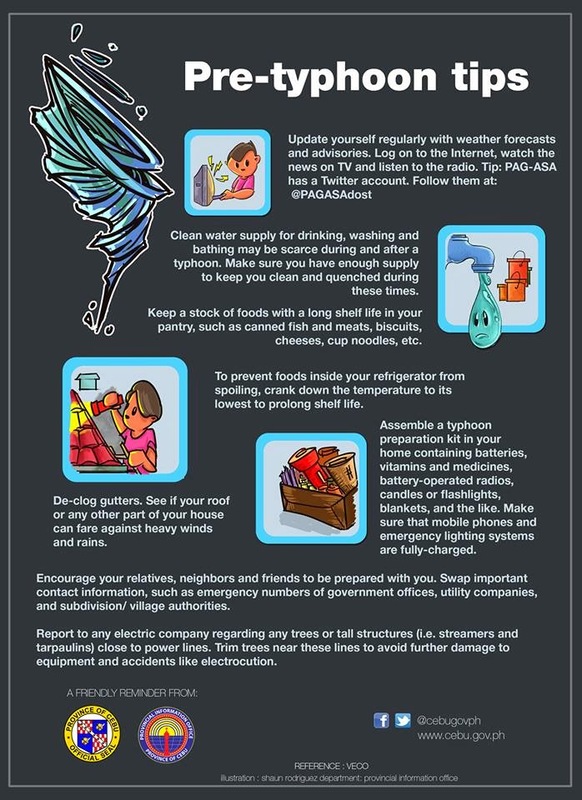 All thirteen (13) areas covered by CEBECO II are 100% energized covering 323 barangays. - It was organized on December 28, 1977 as the 97th electric cooperative in the country. - Started its initial operation on October 1979, taking over the old generating machineries of Visayan Electric Company (VECO) at their branch office in Bogo, Cebu serving only the households within the Poblacion. 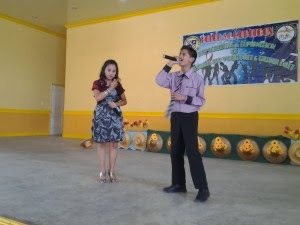 Bogo City's own Orlando Murillo and Champagne Tepan will compete in the 7th Halad sa Kabataan Grand Finals after making it through the 5th cluster eliminations round. The Municipality of Catmon hosted the 5th cluster eliminations last September 5 at the Pedro Monsanto Memorial Sports & Cultural Center. In attendance were Catmon Mayor Dan Jusay ,Vice Mayor Iris B. Gestopa, SB Members Vicente Colonia, Marvin Molde, Lloyd Oyas and Romulo Colonia, DepEd District Supervisor Pedro Sususco, DILG Officer Raquel Cahibaybayan, Municipal Health Officer Edna Orlanes, Social Welfare & Dev’t. Officer Erlinda Sucalit, Police Officer Margie Boto and Planning and Dev’t. Coordinator Nelson Ares who also acted as the master of ceremonies. Picked as the cluster’s top two best vocal duet singers were Rex Anthony Suico and Cathy Capangpangan of the Municipality of San Remigio, and Orlando Murillo and Champagne Tepan of the City of Bogo. The top two best guitar duet players were Jun Aldrich Layague and Jethryl Fritz Alarde of San Remigio, and Horrace Sayson and Isabelo Lauron Jr. of Catmon. All four pairs will compete with the other finalists from the five other clusters around Cebu Province in the 7th Halad sa Kabataan Grand Finals which will be held on the 18th of October at the Cebu Cultural Center in Lahug, Cebu City. Halad sa Kabataan is an annual project of the Provincial Council for the Protection of Children. 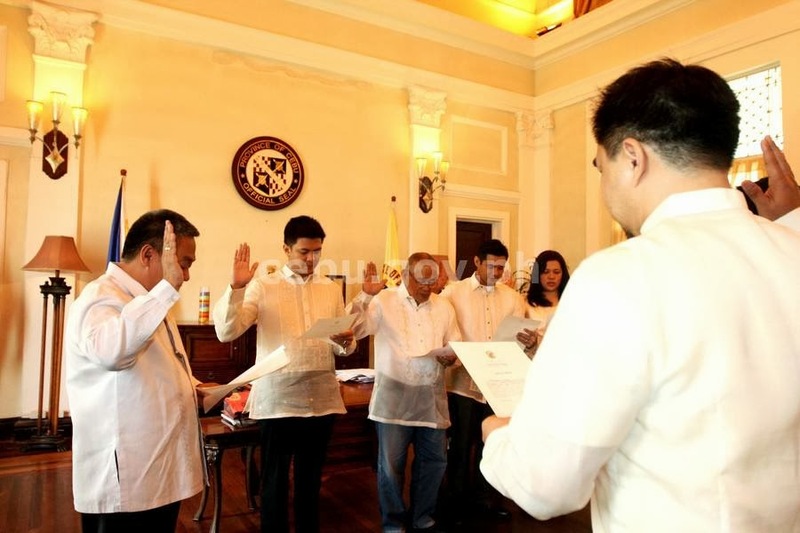 Governor Hilario "Junjun" Davide III led the oath-taking of the new set of officers of the League of Vice Mayors (LVM) at the old Legislative session hall. 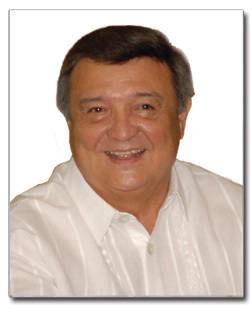 The new president of the LVM is Dumanjug Vice Mayor Efren Guntrano Gica. Vice Mayor Santiago Sevilla of Bogo City as vice president; Jonnah John Ungab of Ronda as secretary-general; Iris Baylon-Gestopa of Catmon as treasurer; Mary Therese Cho of Cordova as auditor; and Noel Dotillos of Borbon as public relations officer. Robert John Selma of Minglanilla and Romeo Villarante of Talisay City for the 1st District. Lito Narciso Creus Jr. of Malabuyoc and Alfredo Awe of Boljoon for the 2nd District. Maria Honeylette Yapha-Lingad of Pinamungajan and Joel Dumdum of Asturias for the 3rd District. Chad Kenneth Escario-Cañares of Bantayan and Alfonso Pestolante of San Remigio got the 4th District posts to the board. 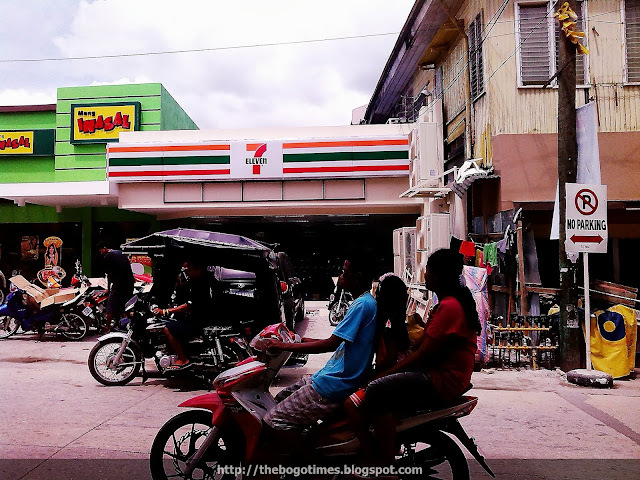 7-Eleven Bogo City is looking for Service Crew. Preferably living in Northern part of Cebu. Submit your resume: SOLARIS AUTO CEBU, A.S FORTUNA ST. BAKILID, MANDAUE CITY, beside Orchard Hotel.